Heavy-duty trucks institute a vital part of the transport industry. Heavy-duty trucks across the globe are responsible for the majority of the freight & logistics movement over the land and are pivotal vehicle in the construction, manufacturing, and agriculture sector. Heavy-duty trucks are predominantly crucial to the mining and construction industry, as dump trucks and ready-mix concrete trucks are necessary to transport a large number of materials. Additionally, current signs of progress in road infrastructure and growing demand from e-commerce sector are likely to boost heavy-duty trucks sales across the globe over the forecast period. Increasing international and domestic trade activates is highly anticipated to drive the demand for heavy-duty trucks. An upsurge in construction and logistics sector is expected to augment the heavy-duty trucks market further. 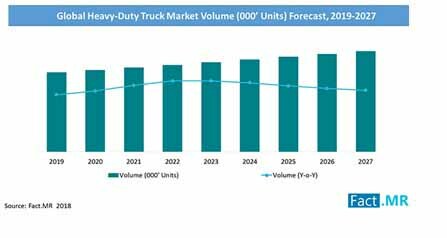 The volume of heavy-duty trucks is anticipated to phenomenally increasing over the forecast period owing to growth in the number of orders of heavy-duty trucks in developing economies. Moreover, booming economic growth with gradual growth in the urbanization had profoundly impacted the transportation sector, which propels the heavy-duty trucks market globally. Technological advancement and an introduction of electric and hybrid vehicles are majorly expected to drive the heavy-duty trucks market over the forecast period across the globe. However, the high cost of heavy-duty trucks and environmental regulation to curb the carbon emission is subjected to hinder the market growth over the forecast period. This report assesses trends that are driving the growth of each segment on the global level and offers potential takeaways that could prove substantially useful to heavy-duty trucks manufacturers looking to enter the market. Main regions assessed in this report include North America, Latin America, Europe, Japan, Asia Pacific excluding Japan (APEJ), and the Middle East & Africa (MEA). The sections, by class, by fuel, and by the application in the heavy-duty trucks market evaluate the present scenario as well as growth prospects of the regional heavy-duty trucks market for 2018–2027. The North America heavy-duty trucks market has been estimated to dominate the heavy-duty trucks market by value owing to the high cost and growing demand, accounting for a maximum revenue share of the market by 2018 end. Europe and APEJ heavy-duty trucks markets are expected to account for over 45% collaborative revenue share, of the global heavy-duty trucks market by 2027 end. Among the emerging markets, the APEJ Heavy-Duty Trucks market is estimated to exhibit a significant CAGR of more than 5.5% over the forecast period, followed by North America with a CAGR of about 4.6%. To provide in-depth insights into the pattern of demand for the heavy-duty trucks market, the market is segmented by class. It includes class 7, class 8, and class 9. The class 7 segment is expected to dominate the heavy-duty trucks market over the forecast period, regarding value, which accounted for more than 30% value share in 2027. The section – heavy-duty trucks market analysis, by fuel comprehensively analyzes the market by fuel used in heavy-duty trucks. The market is segmented into diesel, natural gas, hybrid electric vehicle, and gasoline. The segment, diesel in a heavy-duty trucks market accounted for the highest market share of more than 60% in 2017. The segment hybrid electric vehicle is expected to grow remarkably over the forecast period. The section – heavy-duty trucks market analysis, by application comprehensively analyzes the market by different applications where the heavy-duty trucks are utilized. The market is segmented into logistics, construction, agriculture, defense, mining, and others. Logistics segment accounted for the highest market share in 2017. However, the construction segment is expected to register a healthy CAGR of more than 5% during the forecast period due to the increase in construction sector across the developing economies. Also, increasing demand for heavy-duty trucks in the APEJ region is driving the prominent manufacturers to strategically enter in the APEJ market with an objective to target the opportunities in the region. The heavy-duty trucks market in North America and Europe region has matured, and hence, the companies are targeting emerging markets to increase their sales revenues. The APEJ region is estimated to account for more than 20% market share in the global heavy-duty trucks market in 2018, and this share is expected to grow by a massive rate, causing the APEJ market to grab more than 25% market share by the end of 2027. The rapid economic growth leads this highly populous continent and increases in the e-commerce sector in Indian and South Korean countries, and goods manufacturer and suppliers in these countries will continue to demand the maximum heavy-duty trucks. Fact.MR has profiled some of the most prominent company’s active in the global heavy-duty trucks market such as Daimler, Dongfeng, Eicher Motors Limited, Fiat Chrysler Automobiles, Ford Motor Company, Freightliner, General Motors, Kenworth, Navistar, Nissan, Oshkosh Corporation, Paccar, Peterbilt, Scania, Tata Motors, Toyota, Volkswagen and Volvo. The key market players in the heavy-duty trucks market are focusing on product development and collaboration. Vendors in the heavy-duty trucks market are focusing on developing technological advanced and innovative solutions that can meet the changing customer requirements. Recently, Daimler presented the first electric Freightliner truck to Penske. With the presentation of the first fully electric Freightliner eM2, Daimler Trucks started their day to day-operation testing of heavy-duty and medium-duty e-trucks in the U.S. Daimler’s subsidiary Daimler Trucks North America (DTNA). The heavy-duty trucks market has grown consistently at a CAGR of 4.1%, and the market has been expanding at a gradual pace. The vendors in the heavy-duty trucks market are focusing on product development companies that provide heavy-duty trucks and gain a competitive edge in the market by providing diversified product categories.